Creating a home by hand. Take a small cylindrical vase and place two rubber bands around it. 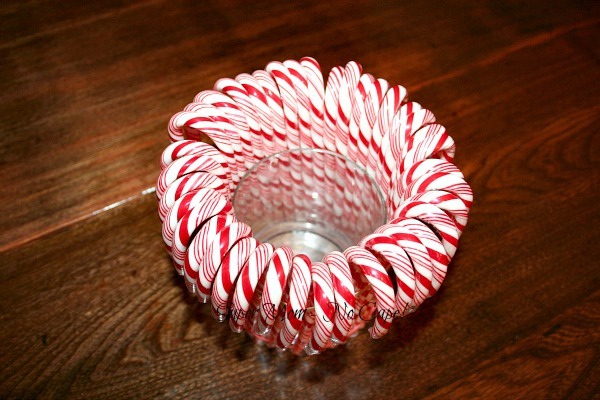 The original instructions called for one rubber band at the top of the vase but I found that the candy canes wouldn’t stay put, so I added a red rubber band at the bottom as well. 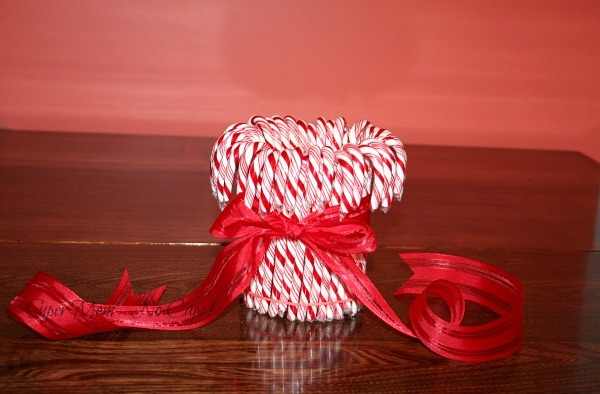 Slip candy canes under the rubber bands all the way around until the vase is hidden from view. 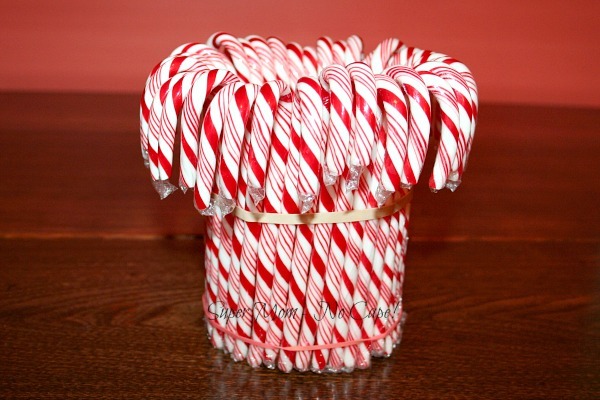 For my vase which is 3½” diameter X 4″ high, I needed 39 candy canes. 2 1/2 boxes of candy canes came to around $5. 69 cents for the thrift store vase and the ribbon came from my stash. A tip from the wise though… don’t use dollar store candy canes. I tried them but they kept breaking. 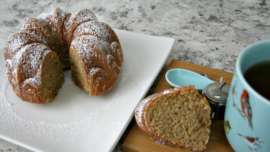 Those weren’t counted in the above cost because they’ll be crushed and used in holiday baking. Add the ribbon to cover the top rubber band. 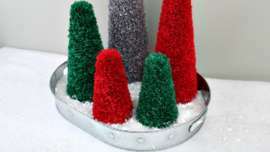 The candy cane vase can be made ahead of time and then a few days before Christmas add red and white flowers of your choice. 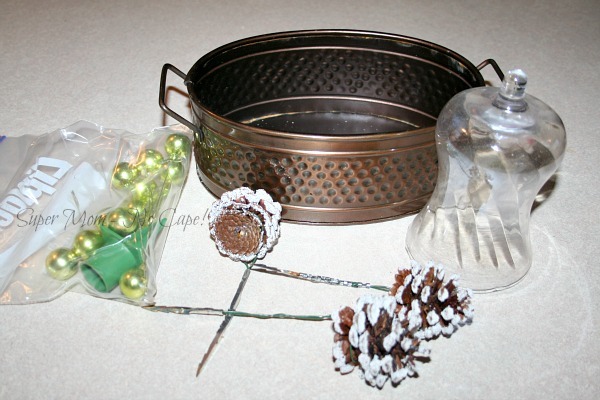 For another quick, easy and inexpensive Christmas center piece using the items pictured below, check out my Easy Christmas Centerpiece post. I’ll be back later today to show you the finished center piece. 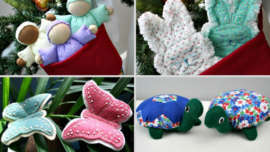 I would be so pleased if you chose to share by clicking on one of the buttons below! Very successful, that vase effect, and I’m looking forward to seeing the centrepiece! I’m very impressed – would never have thought of that idea myself. I had planned to make one of these (for several years actually!) and forget about it every year. I don’t like eating candy canes, but this would make a beautiful gift. 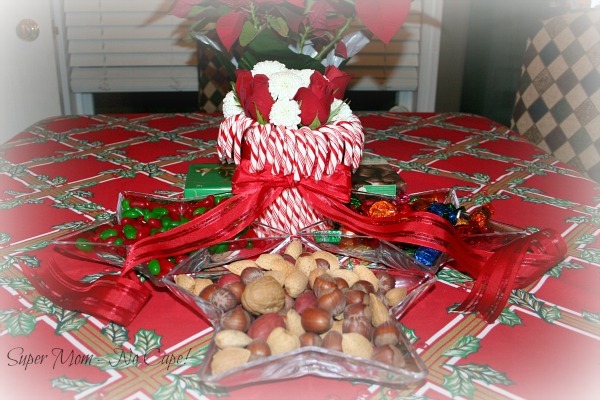 We made those vases in our Christmas craft day at my ward last year! I love mine, but I didn’t get it out this year – or anything else. Just the tree with lights. I look forward to seeing what you do with those parts. Super Mom No Cape! © 2008-2018. All rights reserved.